We live in a world where people constantly comment on the fact that the media in our days have been more influencing than they have ever been before. It is said that their importance is so great, that it actually breaks the trias politica principle and emerges as the 4th power. We get to know what is going on around the world through the media, whereas this could be a magazine, newspaper, radio, television or the newest version of getting informed; the web. If one considers the fact that a happening can be delivered in so many different ways, through so many different points of view, simply because our world is not just black and white, then the role of the media is crucial. What we are actually reading, watching or listening to is in one way or another news through somebody else’s point of view. So it seems like the media have a lot or even too much power in their hands. Especially when someone considers that the opinion of a whole society is shaped by entities that have never been democratically elected, and there was never a debate on whether they are indeed capable of delivering news, then the whole issue becomes even more complicated. What I am trying to point out here is that more often and most easily than we think, citizens are influenced by media which in their turn might serve interests of third parties even if such interests are conflicting those of the citizens. This doesn’t mean that all media are like this of course and most importantly we should not confuse bias with serving someone else’s interest. Every opinion is biased simply because it’s personal. What my point is that we cannot control the extend to which this occurs. But it’s happening, I know it, you know it, but quite frankly there isn’t much we can do about it. 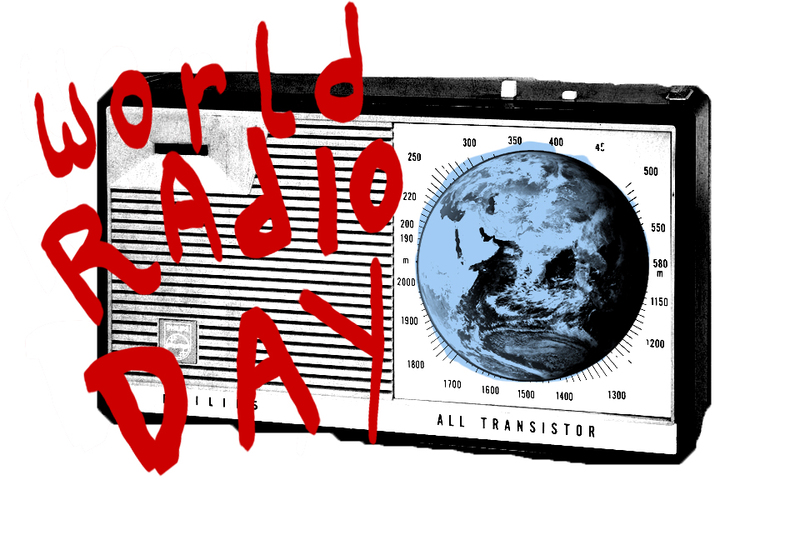 Now, as far as Cyprus is concerned, Community Media are present in our littler island thanks to MYCY Radio which is managed by the NGO Cyprus Community Media Centre and is the only web multilingual radio in Cyprus. Being an example of community media, it gives the chance to people from all different backgrounds, amateurs and professionals to raise their voice on issues that concern not only themselves but also fellow citizens. 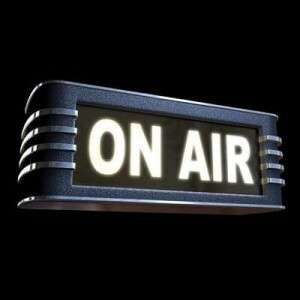 MYCY Radio is a place where you know that what you’re listening to, represents merely the opinion of the person involved. Transparency is something that the Cypriot society desperately needs as we are now for good into the 21st century and MYCY Radio can offer that. It is a place where everyone can get him/herself involved in a dialogue which will serve as a mean for improvement in our community. 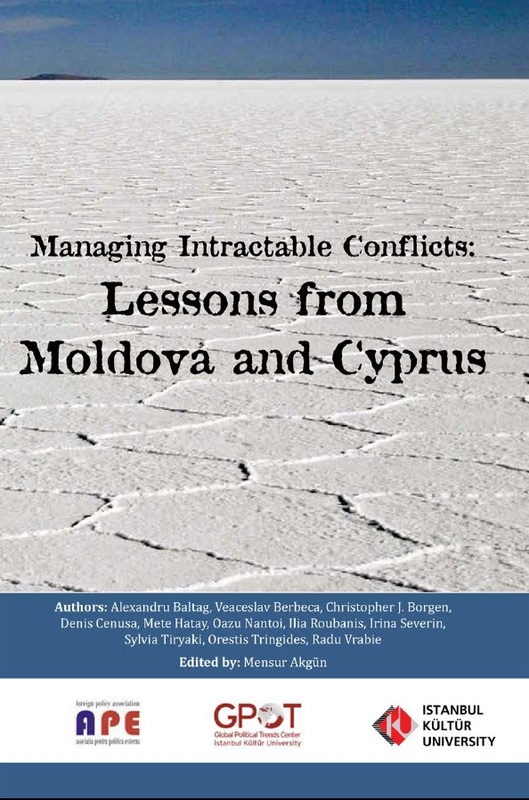 This is a short version of an article included in the publication “Managing Intractable Conflicts: Lessons from Moldova and Cyprus” available here. If it is agreed that in order for the mass media to be able to play a positive role in the peace-building process and cooperation in a conflict region they first have to ensure impartiality in both the way they present the news and in the way they operate, then the media in Cyprus cannot fulfill that role. Some of the problems regarding the media in Cyprus playing an effective role in peace- and trust-building between the two communities (Greek Cypriots and Turkish Cypriots), are; the tendency of advocacy journalism (the kind of journalism that deliberately and transparently employs a non-objective perspective for political or social intentions) and the reliance on external (official). As a percentage of the population, the readership of newspapers is relatively low – the broadcast media is a preferred source of news and opinion. News programs frequently feature developments regarding the Cyprus problem, although due to a limited number of sources, and heavily politically influence, they often resort to advocacy journalism with a dramatized and sensationalized delivery of news about a political development. In many cases there is lack of investigative journalism, with the news falling short of informing the audience as they lack crucial, or background information required to understand and present the issue thoroughly. Very frequently party-centric (male-dominated) and heated debates take place, thus diminishing (and sometimes, deliberately undermining) the role of those who can provide technocratic expertise, or a non-partisan view. 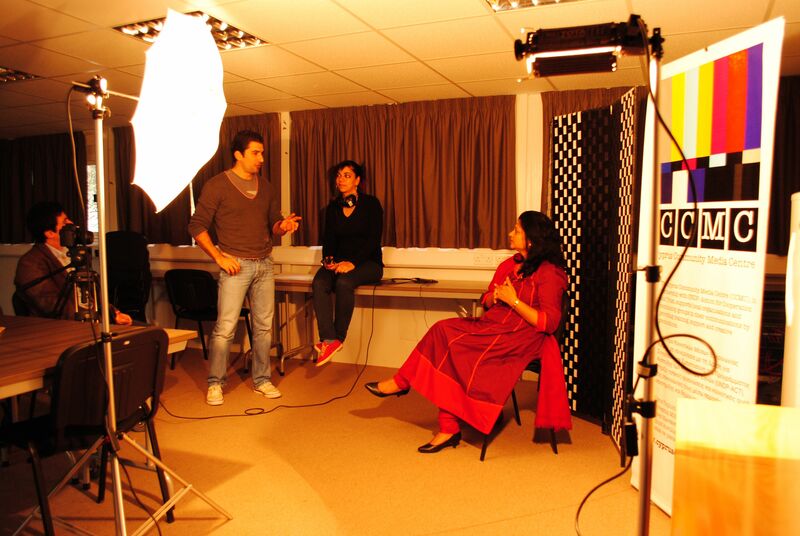 Civil society events that work to bring the two communities together have been largely excluded in the “traditional” media outlets – although in recent years civil society organizations (CSOs) have started employing and increasing their skills capacity in the new media (social media) that indirectly tend to attract more attention by the mainstream media. Exemplar cases of cooperation in the media across the divide (Greek Cypriot and Turkish Cypriot) have largely taken place “outside” of the established administrative structures; mainly by individuals’ initiatives. Financial Dependencies and Political Influence. Media’s susceptibility to either commercial or political influence and pressure is in large part the result of the difficulties encountered in establishing an independent economic base upon which any non-state media enterprise depends on. Practical and Legal Obstacles; Press Freedom and Access to Information. Journalists on both sides of the island are not (entirely) free to deviate from the agreed political modus operandi between their editors/outlet management and political party/ies, or other poles of political influence. Also, journalists on both sides are being hindered to perform their duties due to a lack of an effective access to information legal framework. Cooperation Obstacles Due to Non-Recognition. The fear of “implied” recognition has developed obstacles on basic issues, such as how to address and acknowledge the other side; journalists have employed a terminology when referring to the other side (e.g. “pseudo-state”; the “Greek Cypriot Administration” etc.) that is plainly offensive for the other side. The Barriers of Language and Information. Media outlets communicate in two different languages, Greek and Turkish; therefore, it is difficult for journalists from the opposite side of the dividing line to follow the news on the other side and to have a clear picture of the prevailing opinions on the other side of the dividing line. Mass Media being part of the problem by emphasizing the hardships and obstacles to a settlement, and almost no mention of any prospects for a solution. Neutral or negative Portrayal of Bi-communal, Collaborative and Reconciliatory Civil Society Efforts by the Mass Media. The Portrayal of the “Other” Community by the Mass Media reinforcing a common public perception that one community does not want a peaceful solution with the other by giving disproportional coverage to the few extremist voices of the other side, rather than of those who wish for a solution. During the Annan Plan era, most of the Greek Cypriot media favored its rejection, attacking those in favor, emphasizing the negatives and dismissing, or not mentioning, the positives. There are various examples of cooperation/communication and flow of Information from and to Each Side. In 2003, when, for the first time since the war of 1974, the moving restrictions from one side to the other were eased, journalists from both sides had the opportunity to meet and cooperate with each other. Currently, this cooperation is mostly conducted in an un-strategic manner via the formal structures of the media outlets; most of the times it is e.g. based on a journalist’s personal connections with another journalist on the other side. 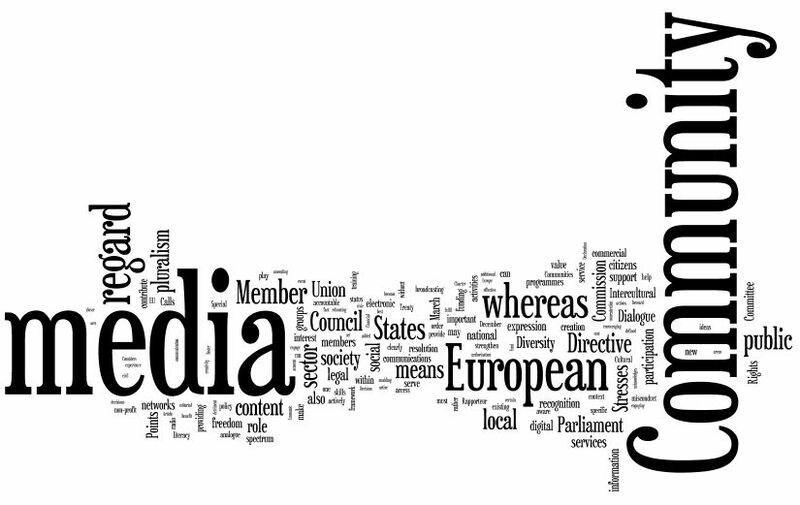 Nevertheless, since 2003, some media organizations have established forms of direct cooperation between journalists and media organizations on the other side thus helping each other not only to get access to primary information on the news, but also helping their colleagues to understand the background of a story; this included featuring articles of journalists from the other community. Because most attempts at collaboration remain hidden below the surface and informal, collaboration at the institutional level remains low. Also, the Internet remains an underutilized forum for media and information exchange. The civil society sector, engaged in cross-community issues, has used social media to promote dialogue and debate on issues of common concern. For these abovementioned reasons, as an alternative to the established traditional media, joint initiatives in the Community Media (an umbrella term that also includes Social Media) have recently been taken by CSOs and individuals from both sides. 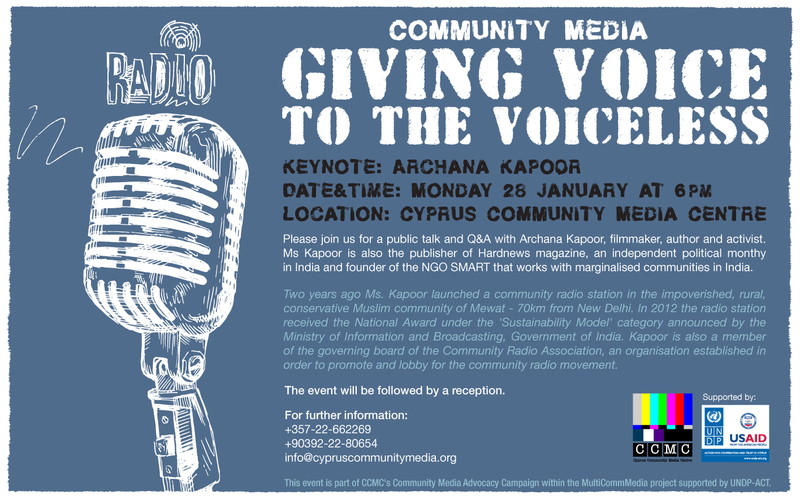 As a result, the established Cyprus Community Media Centre (CCMC) acts as a “transcommunal” CSO (by this term emphasizing that its scope goes beyond the “exclusivity” of Greek Cypriot and Turkish Cypriot communities) that aims to increase civil society’s capacity in providing CSOs with the skills and tools to both communicate their message in the wider public and also to find ways to communicate with the traditional media. CCMC was established as a result of the identified “media gap” that the CSOs were facing and to counteract the disregard that the CSOs have been treated with by the traditional media and, as a result, the broader society. Community Media has been identified as an (alternative) means for building cooperation in the media sector – a sector that is very important for the peace process. You are enthusiastic, proactive, creative, take initiative, have great writing skills and an eye for detail. You have the technical expertise in updating websites,… writing electronic newsletters and managing social networks. You also have a good understanding of Cyprus civil society. Ideally you also have experience in implementing training workshops, and running advocacy campaigns. 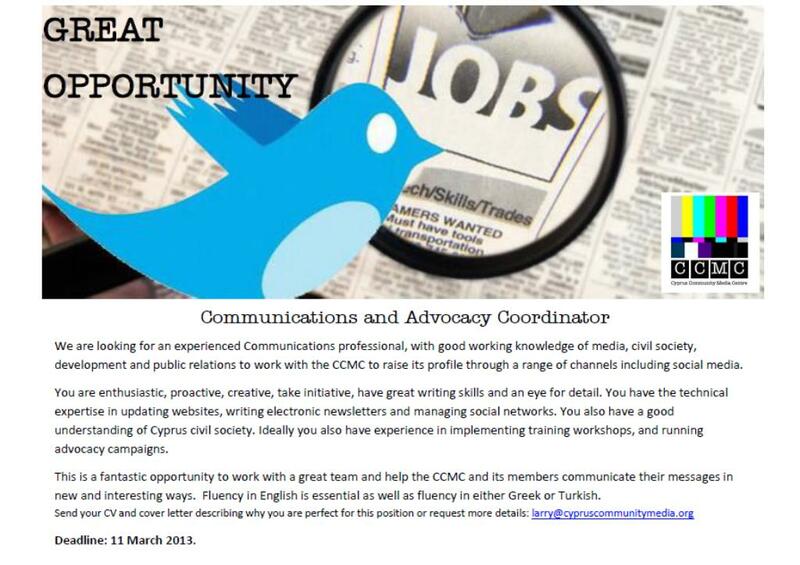 This is a fantastic opportunity to work with a great team and help the CCMC and its members communicate their messages in new and interesting ways. Fluency in English is essential as well as fluency in either Greek or Turkish.